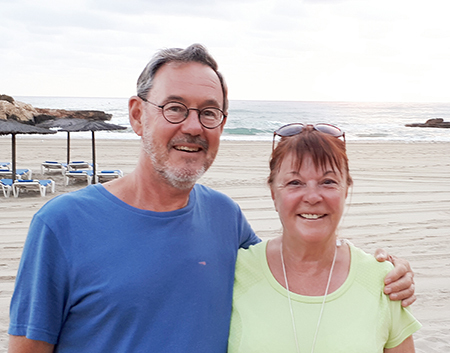 Edward and Ann O’Donnell can look forward to escaping the UK’s cold, wet winters, thanks to HomeEspaña helping them find their perfect home in the sunny Costa Blanca. The retired couple from Bristol completed the purchase of their two-bedroom townhouse in Orihuela Costa in August 2017, after reserving it during a viewing trip a few months prior. They agreed to a purchase price of €175,000, which included furniture. The O’Donnells, who have four children and four grandchildren, began their hunt for a Spanish home in 2016, having thought about buying for more than five years. However, they ditched their plans when the Brexit vote happened, an event that coincided with their first viewing trip to the Costa Blanca. The couple’s townhouse is part of a small community in the popular resort of Cabo Roig. The two bedrooms are on the ground floor, but on the first floor is a large terrace with separate room that could also be a bedroom. At the front, reached via a private gate, there is a south-east facing terrace and small garden, and to the rear another terraced area. They have access to communal pools and landscaped garden areas, while Cabo Roig’s Cala Capitán beach is just a minute’s walk away.